The Lassen County 4-H Youth Development Program offers many fun and educational activities for its members. When you join a community club, you can make new friends, learn about raising animals, be involved in making a difference in our community, learn public speaking and record-keeping skills, participate in the county fair and 4-H camp, create things for everyone to enjoy, and go on exciting trips! How do you join? There are nine 4-H clubs in Lassen County. 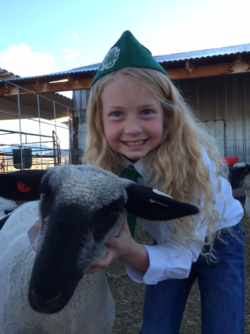 Pick a 4-H club you would like to join, then contact the club leader, or stop by the 4-H Office at 707 Nevada Street. Enrollment time in most clubs is September through November. Lassen County 4-H Program is open to youth currently enrolled in kindergarten through 19 years of age. The youth member insurance fee is $46.00, and the adult leader insurance fee is $16.00. Enroll on-line. Choose projects that interest you. A variety of projects are offered including animal care, arts & crafts, community service and leadership, and much more! You don't have to live on a ranch or a farm to participate. Projects offer the opportunity for hands-on learning. Club activities occur after school, in the evenings, and on weekends. Some project groups meet once a week. Others meet once or twice a month. The purpose of these meetings is to guide the members in gaining knowledge, attitudes, skills, and habits needed to complete their work successfully. Project manuals and guides, reports, and record forms are available. To learn more about the California State 4-H Organization and the National 4-H Organization, go to their websites: University of California 4-H Youth Program and National 4-H Program.